Overconcentrated refers to a situation where one player has used many stones to achieve relatively little. An example is shown here. Black has played tenuki after the first kakari and pincered the second with a close pincer. White has invaded the 3-3 point and the sequence has been played out. After the sequence, White has made a decent amount of corner territory whereas Black is left with a strong wall facing the top right. However, is too close to his wall to be efficient. A rule of thumb says that you can extend n+1 points from an n-stones long wall. 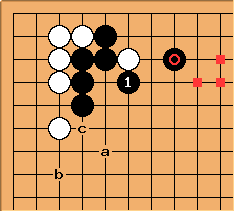 With this wall, which is four stones long, Black should therefore have extended five points, not the short three-space extension he has made. In a position like this, White can later (always depending on the rest of the board) further reduce Black's wall's effectiveness by pushing from e.g. a. Black will get very little benefit from his wall - he is overconcentrated. You realize that this is (almost) joseki? The only difference being that White has sente instead of Black. So Black is not overconcentrated. Since my joseki knowledge is limited, no, I didn't realise it. However, I have played Black here and I always end up being squeezed from the direction of a, and end up with little territory. I have recently started playing one space to the right and the results seem a lot better. Maybe the fact that White has sente gives him the chance to approach from the right afterwards, and that is why I feel that this is wrong? No, it is not a major disadvantage for Black, that White has the option to play the next move here. 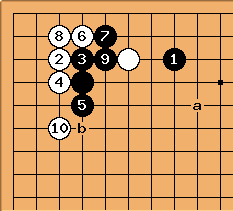 In the joseki that Arno mentions, which is shown in this diagram, top players often choose to play tenuki with Black. And if they do, White b is more common than White a. What you do wrong, is probably the way you look at this position. Rather than seeing White a as a threat to your territory, you should see it as a stone that is asking to be attacked. In fact, White a itself is very bad, because it invites Black to make territory on the top, but if White plays lower, she will still get a pincer from Black and have her stone attacked. In that case, Black will indeed not get much territory here, but he will get it on the right half of the upper side. Apart from that, one should also take care when to play this joseki. If White can play from the direction at a (but please do so on the third or fourth line!) and get away with it, there apparently is a good white position in the upper right. In that case, this joseki is not a good choice. If Black has a useful position on the left side, he should play at rather than in my joseki. If he has neither, is wrong, and Black should have chosen another joseki to begin with. 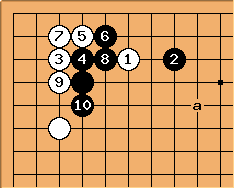 As for your pseudo-joseki, is the better move here. Black will have to live in the corner now, causing White to become thick on the outside. Next, will be much too close to the white thickness to be effective. Rather than , standard joseki is to attach at b or c, or to run out into the center at . Interestingly, the position you arrive at is quite closely connected to one that is known to be overconcentrated. If Black continues the joseki with here, this is considered overconcentrated, because and overlap. 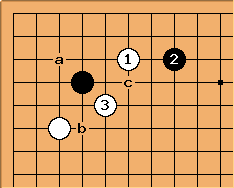 If Black continues, the joseki calls for Black a, although in some positions Black b or Black c is better. 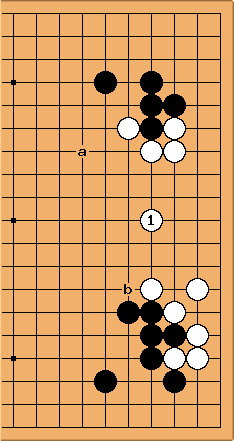 Black 1 would be considered joseki if the black stone were at one of the points marked with a square. White 1 seems produce overconcentration. How much does White lose compared to, say, a or b? It depends on the position, how bad is your overconcentration? And what are its consequences? In the case you give, I don't think loses very much. It might even be a reasonable move. Yes, it is overconcentrated, but the fault of that lies with White's previous moves - she should have thought of this before playing whichever of the joseki she played last. Saying that it costs less than a move in the opening does not say much - a move in the opening is worth about 25 points, Few strategic errors are that large.